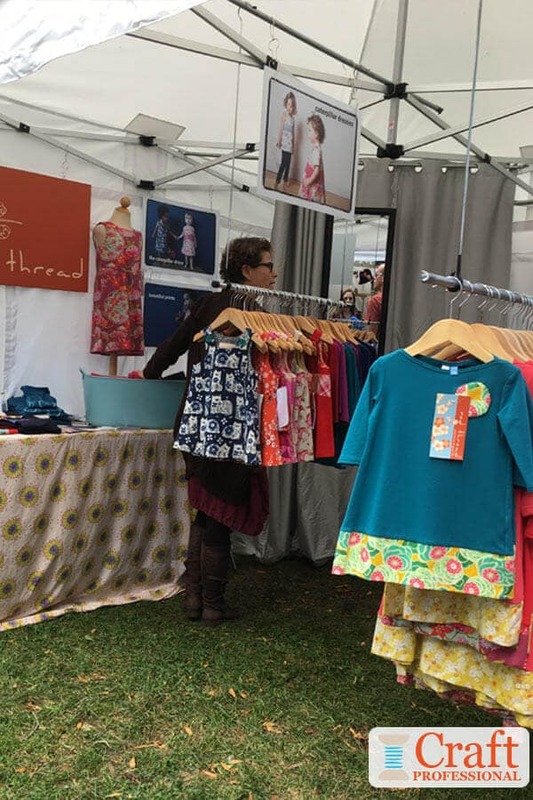 There are plenty of options for portable clothing displays that you can use at a craft fair. Waterfall style clothing racks are easy to browse and allow you to hang a lot in a small space. Gridwalls are another option. They are portable, allow for a lot of space for customers to walk around your booth, and can be fitted with a number of different hooks and accessories to display your work in different ways. Or, for an extremely inexpensive option, you could try hanging a few rods from your tent frame and use them for hanging your clothing. 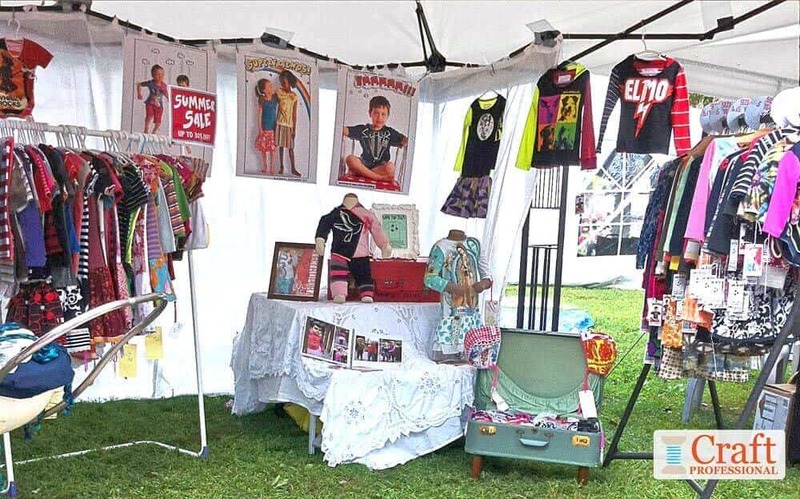 You might also use a dress form to display one or two of your most special pieces, or just hang a few items on a clothesline for a fun casual look, or from your tent frame to highlight your most eye-catching items. You'll find examples of these, and other clothing display options, in the photos below. 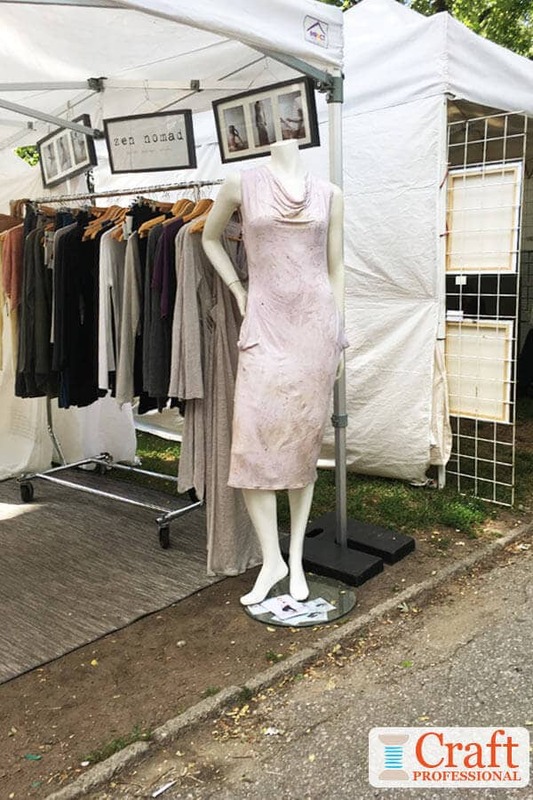 The gorgeous handmade dress shown in the photo below and on the left becomes the focus of the booth when displayed on a mannequin. 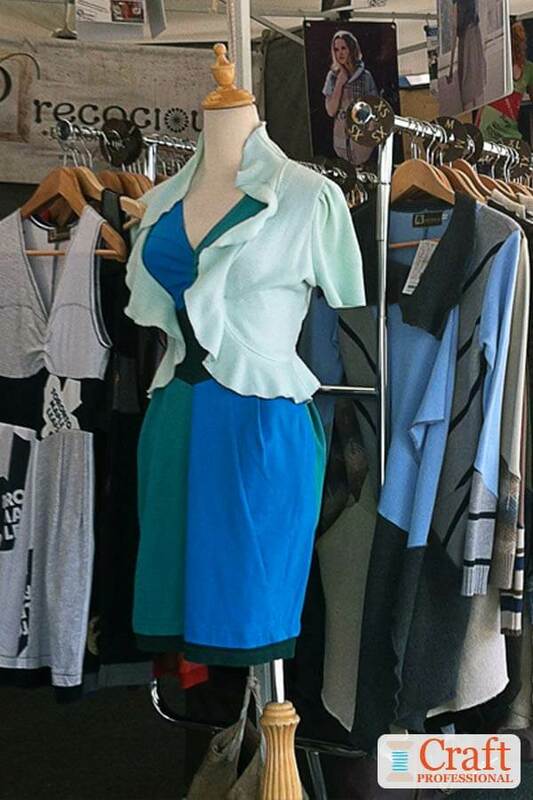 Displaying a special piece on a mannequin is an extremely simple way to call attention to an item and help customers imagine themselves wearing it. A dress maker's form is good alternative to a store mannequin as shown in the photo below and on the right. 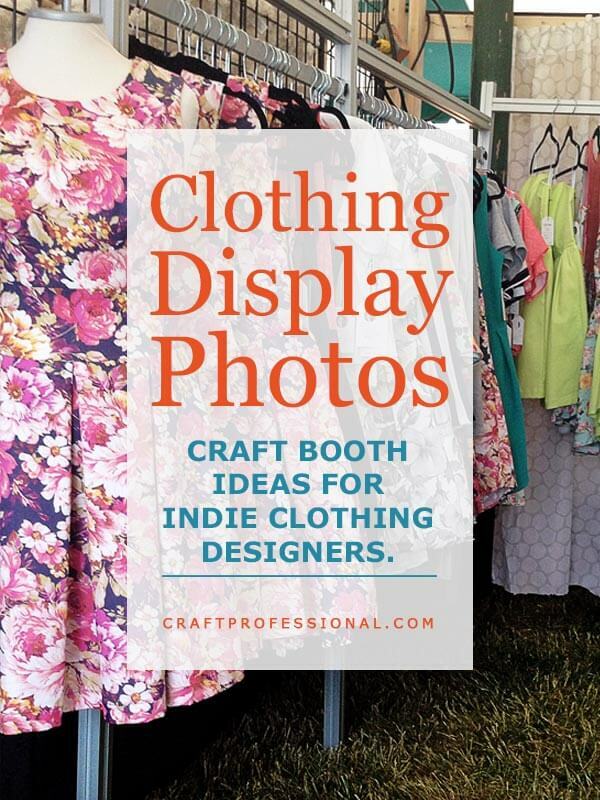 It suits the handmade story of your booth, and if you design and make handmade clothing, there's a very good chance you'll already own a dressmaker's form, so you might not need to buy this extra item for your display. If you don't have a dress form, or if the one you use isn't well suited for display purposes, you can check out Amazon.com. They have an excellent selection of dress forms in different styles and prices. If you prefer to go with a mannequin for your display, you can find them on Amazon as well. 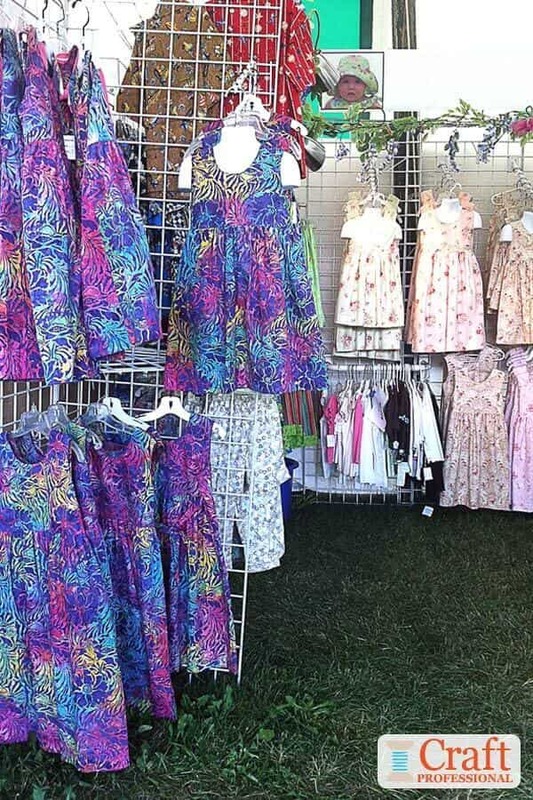 The four children's clothing booths pictured next each contain very different clothing styles. You'll see the clothing style reflected in the booth design. The clothing display in the booth picture on the left is extremely portable. This booth was at a show that's part of a bigger festival in a busy city. The streets in the neighborhood are narrow, and they are always congested with traffic on the weekend of this show because large crowds of customers flock to the show. Transportation challenges means vendors are generally careful to keep their displays as portable as possible. Simple rods hung from the tent frame show off these items well. These display items would be quite inexpensive. They would pack quickly and wouldn't require much storage space. Here's a great example of using gridwall panels with waterfall hooks (designed to work with grid panels) to display children's clothing. Notice that the gridwall panels aren't simply placed around the back and sides of the booth. Instead, one of the gridwall panels has been placed perpendicular to the side wall to add extra interest and break up the flow a bit so your eye moves around the booth. I love the fact that this craft artist has placed her most vivid designs at the front of the booth. The bright blues and purples of the dresses at the front left of the booth really catch your eye, cause you to pause, and draw you into the booth. 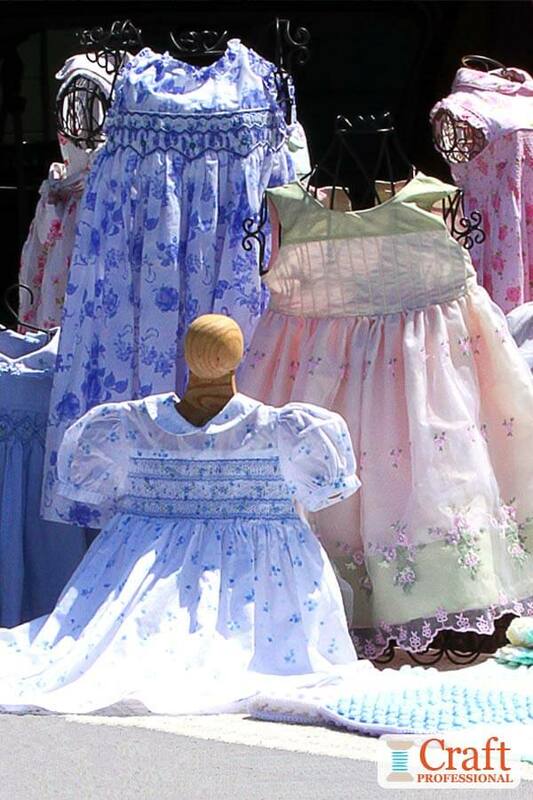 The smocked dresses pictured here have a completely different feel. They remind me of the beautiful dresses my grandmother used to make for me, so they fit in well with the simple table cloth and the handmade afghan. Notice the use of small dress forms again to highlight each special item. The next photo shows clothing with a funky-retro vibe, and that feeling is highlighted in the display. Notice the old suitcase and baby carriage (partially visible on the lower left) that are well suited to the era of the recycled fabrics used in the clothing. That carriage would take up a lot of space, so you'd need a large vehicle to transport a prop like that. However, it would also be incredibly useful for transporting items from your vehicle to your booth for setup and tear-down, so it could serve dual purposes! 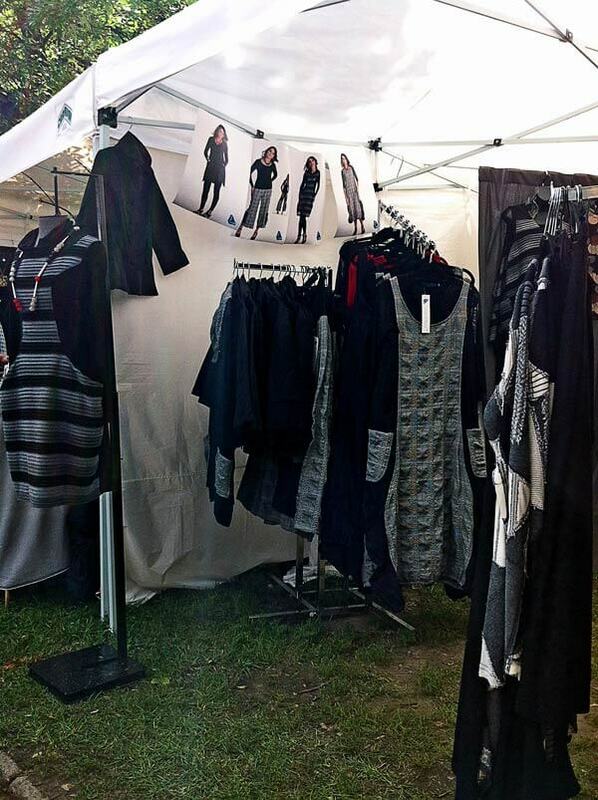 Also notice the posters at the top of the booth showcasing photos of this designer's clothing, as well as some stand-out items hung separately from the tent frame so customers passing by can quickly see this designer's distinct style. This booth makes good use of waterfall clothing racks. These racks are affordable and sturdy. They hold several items without taking up too much booth space, so customers still have room to move through the booth. Notice again that this designer has brought one special piece to the front of the booth on a dress form, and she has used posters at the top of her booth to show off a few of her designs. 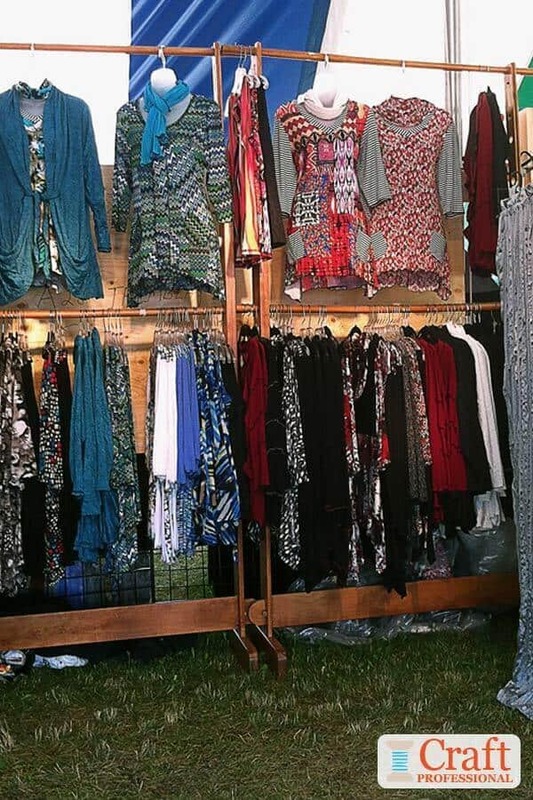 These wooden clothing racks help to create an upscale boutique look in this booth. If you look closely at the racks, you'll see the rods and bottom cross pieces look like they are designed to come apart quite easily, making these racks extremely easy to tear down, transport and store. Instead of packing the top rails with a lot of clothing, just a few pieces are hung at the top and turned so they are easy to see. It's not fully shown in the picture but there is a change room on the right to provide shoppers with some privacy to try on items.